But really, you can't do that. Something written by e.g. prod80 isn't copyrightable by you, that's not how it works. He wrote it, he owns the copyright, not you, left alone re-license it, especially things from e.g. Ubisoft . See how things can go in a different route very quickly, even if you don't mean any harm? Likely prod80 doesn't give a hoot, as it normally goes, and it's highly likely you all acted in good faith, and that's perfectly fine. The majority of cases in OSS land where things aren't done how they should be are cases of people acting in good faith and/or where the original authors/owners really couldn't care less. Most people, like you too, act in good faith and mean no harm whatsoever. It will be fine. Last Edit: 2 years 3 months ago by OtisInf. I asked all of these people if it's fine, posting them my project, and they agreed. Some disagreed, then I didn't use their code. Obviously not Ubisoft, I should maybe remove that code even, because I got it from someone else, and changed author later on as I found out where it really stems from. But this is MasterEffect, where you're right, I added almost everything I could find. But im not so savvy with these things, in the original ME I think I only licensed the code I actually write on myself. For Framework and Shader repo, ppl who.ported it just copied my license stuff into it. However ME hasn't been stolen so far, but my ENB mods (which contain only code from me, as most of the code available is useless) have been stolen all the time. Picked up the low hanging fruit of fixing a url in the readme . Nice code in there, Crosire! Already learned some stuff with respect to intercepting (and thus blocking) input, which is great for my injectable cameras: didn't think of hooking the actually windows functions to intercept them! Yeah, I'm looking through the code as well. I don't have any idea what I'm looking at though XD. I Also can't build at this point in time, I assume it has something to do with me not having "Latter" which is said to be required, yet I can't find it anywhere... Regardless, this is f-ing cool!!!!!!!!!! "latter" is an english word meaning the last one of the previous list. It refers to Visual Studio in this case. Make sure you have cloned all Git submodules too. Ah. Silly me with my horrible english So I'm assuming you mean to have both visual studio 2013 and visual studio 2015 installed?? BTW, I have all of the submodules!!! Last Edit: 2 years 3 months ago by NoMansReshade. Just quickly -- how will we try to ensure 'safe' versions out there? I.e, insist people only download from reshade.me? Or sign binaries? And Crosire are you going to do a Linus and accept patches and build the 'official' releases on occasion? Some of us aren't programmers, so we'll be relying -- even if you get too busy to work on it anymore -- for someone (presumably who you trust) to be a caretaker and create official builds as it new features are added etc. We could try and maintain 3.0.5 as-is, and do a link redirecting to a BuildBot from the crosire's git. Other ReShade-releated stuff could be forks. @NoMansReShade You only need Visual Studio 2015. Yes. Official builds will come from this website. I continue to maintain the project, just not as frequently with my own contributions. Why did this happen? He said he downloaded the repo just fine. I'm not sure.... He cloned it through github, right? And if so, make sure you included all of the modules. 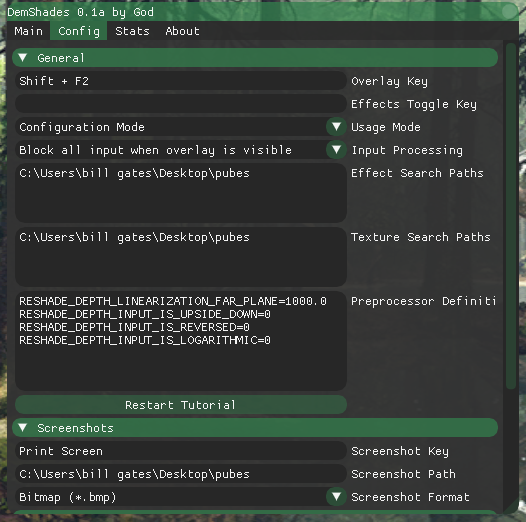 Also check to make sure you don't have a "Reshade" folder inside the solution folder! I see people are already using this for the good. Last Edit: 2 years 3 months ago by BlueSkyKnight. This causes gl3w_gen.py to be unable to execute CL.exe as it cannot find it, it seems to be the only thing breaking the compilation process for me. I'm gonna try and see if I can fix this for VS2017, maybe need to point the python script to the correct path? , after running it even allows easy access to the compiler from the command prompt. could fix the issue (maybe change x86_amd64 to just x86 OR amd64 depending on the target platform). Last Edit: 2 years 3 months ago by luluco250. It doesn't need CL.exe. Forgot to mention in the readme that you need a python installation in your PATH evironment variable though or else the script cannot execute. It should still work with 2017. @Crosire. Question, How did you compile the setup with both the 64 and 32 bit dlls? Would I just compile both and then compile the setup? Got it! I compiled both DLLs and then compiled the setup and everything works perfectly!! I think they're set to 0 by default. Well, after struggling way too long with the glorious installation process of VS2015 with such wonderful annoyances like this, this or this (just to name a few...), I'm finally able to build ReShade for myself. -in VS2015 always set the target of the project to 10.0.10586 before building (can be a problem if multiple sdk's were installed), look for option "retarget solution"
Nope. The other two should be default if you install VS for C++ development (the setup is configured for C# development by default for some reason).